This post is sponsored by Archer Daniels Midland (ADM) Company. All opinions are my own. Will you check this out? 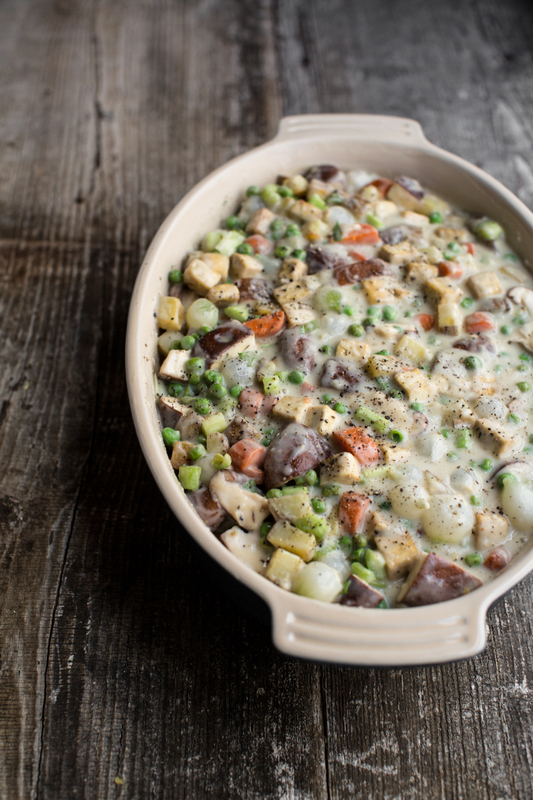 It’s a biscuit pot pie with a rich and creamy gravy, bright green peas, delightfully chewy cubes of roasted tofu, sweet carrots, savory shiitake mushrooms, and succulent chunks of russet potatoes. The best part? A golden brown biscuit top. For this recipe, I wanted to streamline everything. Trust me, I know none of you want anything complicated or fussy. First off, all of the vegetables have different cooking times in a traditional pot pie. If you were to cook everything together- it wouldn’t work. The potatoes would be too hard and the peas would be too soft. I’m not into mush and you shouldn’t be either booger. To remedy this, I roast the tofu, carrots, and potatoes separately. That gives them a head start. Then I cook the onions a tad bit in the gravy which helps to soften them up. THEN I combine everything including the peas, carrots, mushrooms and celery…that way, after the bake, they stay plump and hold their shape. This provides a nice contrast of textures for the savory pie. Now for the topping, I wanted to cheat because I’m bad, and I know you probably are too. So, I used organic canned biscuits and chopped them up. That’s right, you heard me. I’m not ashamed. And if you knew how many batches of homemade biscuits I’ve made you would understand. One less bowl to clean up if you ask me! If you’d like to use either one of the biscuit recipes in my cookbook- knock yourself out! They both would work perfectly for this. I’m just not in the mood. One other reason why I love this recipe is because while the tofu, potatoes, and carrots are roasting, you have time to put together the rest of the recipe. While it is baking in the oven, you have time to clean up. That way, once it’s done, you can fully enjoy the dish. You are very welcome! This meal is hearty and satisfying. The tofu in combination with everything else provides a solid punch of protein and is deliciously nutritious. I think once you try this, it will become a new favorite for a busy weeknight dinner. So get on it! 1. Pre-heat oven to 400 degrees F and line a large baking sheet with parchment paper (use two small ones if needed). 2. Add tofu, potato, carrots to the baking sheet. Sprinkle with sea salt, black pepper, nutritional yeast, dried thyme, and olive oil. Gently toss with hands until thoroughly coated. Spread into an even layer with fingers, separating the pieces as much as possible. Roast in the oven for 30-40 minutes, until the potatoes and carrots are fork tender. Once done, set aside. 3. Combine the peas, mushrooms, parsley, and vinegar into a 9 x 13” baking dish. Season with ½ teaspoon sea salt and few cracks black pepper, about ¼ teaspoon unless you prefer less. Set aside. 4. Next, melt vegan butter in a skillet and add flour. Cook over medium heat, stirring frequently with a wooden spatula until the mixture is lightly bubbling, about 5 to 6 minutes. Add pearled onions and celery and mix thoroughly. Cook for an additional 5 minutes to soften the onions, stirring often. 5. Add 2 cups milk and stir until well combined. Once smooth and thick, remove from heat and stir in an additional 2 cups of milk. Mix well and add a pinch of sea salt and few cracks of black pepper. Pour over the baking dish of vegetables. 6. Transfer the roasted tofu, potatoes, and carrots into the baking dish and gently mix. Season with salt and pepper to taste. Use back of spoon to evenly smooth top of mixture. Transfer the dish to the baking sheet (in case any filling bubbles over). 7. Lower the oven to 350 degrees F. Remove the biscuits from can and cut a cross into each one and all the way through, creating 4 triangle pieces per biscuit. Beautifully place the biscuit chunks on top of the mixture. 8. Combine 1 tablespoon of melted vegan butter and 2 tablespoons of plant-based milk in a small cup and gently brush over top of biscuits. Sprinkle with a dusting of sea salt, a few cracks of black pepper and a light dusting of nutritional yeast. 9. Bake for 35 minutes. To brown the tops, crank the heat up to 400 and cook for an additional 10 minutes (a total of 40 minutes). Remove from oven and let stand for 10 minutes. Season with salt, as needed, and serve. For the larger pieces of carrots, slice in half lengthwise and then into half-moon rounds. You want the chunks to be all the same size (at least close) so that they cook evenly. Same goes for the potatoes. You know? You could easily divide this up into small ramekins for individual servings, which would be super cute for a dinner party. Yes, most canned biscuits are vegan. By accident? Probably. But they still are- so there. Of course, if you can find the organic variety the ingredients will be a little less sketchy. If you are completely opposed to canned biscuits, then one batch of my drop biscuits or golden garlic biscuits will work perfectly for this recipe. Simply make the batter when ready and use an ice cream scoop or spoon to plop it on. Please note that the temperature will need to be higher for the homemade biscuits, so maybe reduce the total cooking time to work with the book recipe. This dish would work beautifully with a cornbread topping as well. I haven’t tried it and I am just thinking out loud. However, that sounds really bomb doesn’t it? For a fun, colorful variation, swap out the russet potatoes for sweet potatoes and add a few cups of shredded kale. Yum.